Coming from Monmouth College, a small, liberal arts institution in Illinois where he served as president for nine years, Dr. Mauri Ditzler, was announced yesterday as Albion College’s 16th president. After exchanging his blue and purple tie with the Albion purple and gold (a feat he accomplished on stage more aptly than most of us can do before a mirror), Ditzler spoke about what makes schools distinctive. The secret rests not in stand-out programs or special offerings, Ditzler said, but in the community and heritage of the college. It’s about figuring out who we are now and getting in touch with what has made the college great in the past. What follows is an edited-down transcription of a conversation Ditzler had with myself and reporters from several other community news outlets. What attracted you to Albion? A friend knew the Albion presidency was open, and he told me, “I know Albion College and I know you, and I think you’d be a good match.” And I knew Albion and its reputation so, even though I was not looking for a new job, my ears perked up. He said, “I think Albion is looking for an individual who can communicate across boundaries and can talk to alumni, students, faculty, board of trustees and find a common mission—a common goal—amongst those institutions and make sure everyone is presenting the same message,” and so that is how I presented myself to the search committee. So what are your goals coming into Albion? As I said in my opening remarks, my first goal is to find the “mysterious paths” that connect Albion College to the rich heritage of the liberal arts. Sometimes those channels through which we interact with the great ideas of the liberal arts, going back to Socrates and Cicero, and the wisdom and ideas of our founders get blocked. Now, we don’t want to do everything old fashioned. This is the 21st century and there is so much wonderful technology and people know so much more about the learning process than they did 100 years ago, and we need to always be looking at innovating. But we will actually spend more time talking about finding those wonderful, rich paths that connect us to our history, and we’ll be opening those paths up, and we will develop a sharp, succinct message that everyone here believes in. The most successful colleges in these difficult economic times are the ones that can deliver a value proposition that is short, easy-to-remember, and is something that our faculty buys into, because the last thing you want is to have a message attract people and then when they get here have people say, ‘Oh that’s not really not what’s going on.’ It’s not an easy task. I think it may have taken me all nine years at Monmouth to get there, and I think we are there now, but I’ve learned a lot as a college president, so I’m hoping it won’t take nine years here at Albion. What challenges are you anticipating coming into this new position? The biggest challenge for Albion is going to be the biggest challenge for Kalamazoo, for Hope, for Wabash and Depauw and everyone else in the GCLA, and that is, “How do we reverse this trend or belief that our sector has become irrelevant?” Our approach seems counterintuitive. If you say to a young person, “Come to our college and you’re going to study philosophy and history and business and chemistry, and somehow all of it will mix together in a way that’s going to make you a valuable employee for your company, and you will lead a rich a rewarding life,” they’ll say, “But what I really like is business, so I want to go someplace where I don’t have to take chemistry or philosophy or history. And you know what? I bet I get a better job because I know more business items than everyone else.” But the world discovers over and over again that the most valuable employees are those that can integrate knowledge from different disciplines to solve the tough problems. There are lots of specialists out there, and I am delighted there are. When I get on a 747, I want to know that pilot knows more about flying 747s than anyone else in the world, but when it comes to solving society’s problems, the real leaders and those produce the groundbreaking work are those who have this liberal arts approach. And if liberal arts colleges slip any further, I fear for the competitive edge of our country and economy. The challenge is to let people know we are relevant and vitally important. You seem to have some profound beliefs in the liberal arts, so were you attracted to Albion because of its liberal arts tradition, or because you think it needs to get back to that tradition? Because there are many on this campus who would argue that while the liberal arts is a part of the school’s rhetoric, it’s not so much in practice. I came to Albion because of its strong tradition in the liberal arts. But who can define the liberal arts? People are not even sure if it’s singular or plural: “liberal arts is” or “liberal arts are?” Cicero’s definition of the liberal arts is very different from Socrates’, so we have argued over it for millennia, and sometimes one side dominates over another. I’d love to be involved in the conversation and facilitate the conversation about that here on campus, and what I hope we do is think about our history and examine when our pendulum swung too far one way or too far the other. Are we listening to too much Cicero and not enough Socrates, or vice versa? I don’t have a preconceived notion of the idea, and even if I did, my role is to say, “Let’s have that conversation in a civil way, and let’s find some consensus.” People on campus may walk away with differing opinions, but at least we will use consistent language. How do you think students here today conceptualize the liberal arts? That’s a great question, but, you know, I don’t really have answer to that, because I haven’t talked to enough students yet. We’re still getting acquainted. But there are mechanisms you use to find out. You listen to lots of students, and you do it over and over again. At my previous institution, I set a policy that by Thanksgiving of a student’s first year, they would have dinner with me in my house, and then after dinner we would sit on the floor by the piano and we would talk about what they were learning that they would call liberal arts. We did it in groups of 10 or 20 or 25 students, so in nine years, I think I can say that almost every student has told me the top five most important things they were learning in their freshmen year, and that is how I learn about how the student body thinks about their education. I listen year after year, and I see if those conversations are changing or evolving. I hope to do the same thing here. Ask me next Thanksgiving about what Albion students think of the liberal arts education, and I’ll have an answer for you. Now, it never works to take a practice from institution and plant it in another exactly as it is, so we will find out what works here. It’s one of the reasons I’m trying now to relocate the president’s residence from a site that’s remote from campus where students can’t drop by to a site close to campus. I do not know where that will be, but my request has been to find a place for me to live where groups of students can walk over and have conversations. Is there anything you would like to say to the Albion College student body? I believe that graduates of Albion College—and similar private, residential, liberal arts colleges—will have the opportunity to change the world. I believe that students who come to a place like this are idealistic, and your generation is the most idealistic generation we’ve seen in a long time. They want to make an impact and change the world. That’s why they study environmental science, go to medical school, or study civic engagement in the Ford Institute. And so my message to the student body is that you can develop and pursue that dream at Albion College, and I will do everything I can, while I’m here, to make certain you can do that—that our focus is on allowing students to pursue idealism. We used to talk about getting students a great job, but what we also want to say to young people is that we will allow you to pursue your calling. Now, you can’t pursue your calling until you discern what it is, and that’s why it’s great that students can maybe change their major two or three times. So we’re not only helping them get ready to pursue their calling, but we’re helping them discern their calling. Students got great advice from their kindergarten teacher, their little league coach, their 4-H leader and their 8th grade math teacher, and all those people told them wonderful things, but at some point, students have to put all that together and decide what it is they want to do, and there is no better place to do that that at a liberal arts college. 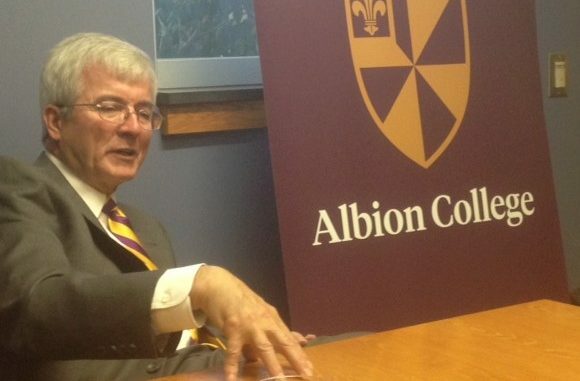 So we will do everything we can at Albion College to help students pursue their dreams, and, if they will listen, I will suggest that that dream be to change the world.